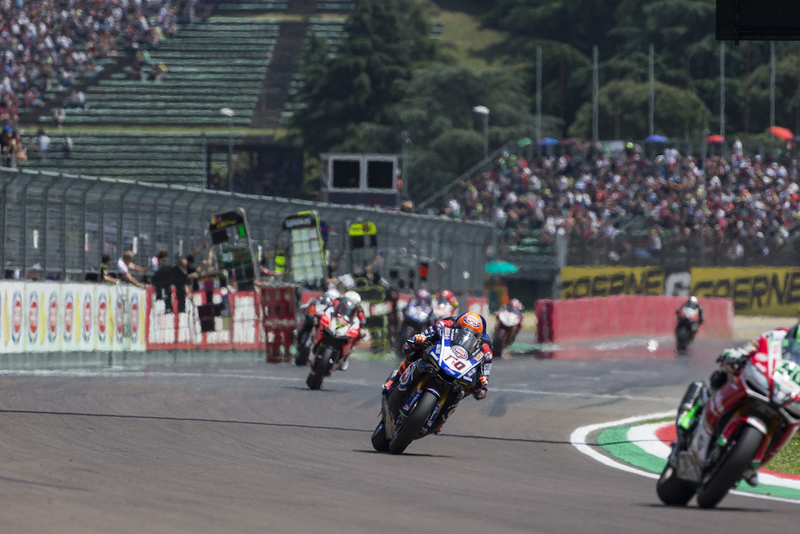 The Pata Yamaha Official WorldSBK Team battled hard throughout Race 1 at Round 5 of the 2018 Motul FIM Superbike World Championship in Imola on Saturday. Michael van der Mark had a tricky SP2 and could only qualify in 12th but when the lights went out he mounted a stunning charge through the field to secure a superb sixth place finish. It was another gorgeous day at Imola with blues skies and the sun shining on the iconic Autodromo Internazionale Enzo e Dino Ferrari circuit, meaning track temperatures were well over 40°C. Imola has not been the happiest of hunting grounds for the Pata Yamaha Team since the manufacturer’s return to the WorldSBK Championship but van der Mark went some way to turning that around on Saturday. The 25-year-old Dutch rider – fresh from his double podium in Assen – ended Friday’s practice in 5th overall with a 1:47.461 and used FP4 to try and work on race pace and the stability of his R1. In SP2, he just could not produce the kind of pace he was expecting, failing to improve on his Friday time and setting a 1:47.710, which meant he would line up for Race 1 12th on the grid. When the lights went out the 2014 WorldSSP Champion did not have the best of starts and dropped down to 14th in the first corner. Showing excellent maturity, he did not panic and embarked on a sensational charge through the field, combining some breath-taking overtaking manoeuvres with very consistent pace. By the end of the first lap, he was already up to ninth place and by the time they crossed the line to start lap 4 he was in seventh. As the race went on, his pace continued to improve and on lap 6 he dropped into the 1:47’s for the first time and was chasing down Michael Ruben Rinaldi in sixth. While everyone else’s lap times were dropping, van der Mark continued to improve and set his fastest lap of the race on lap 12 as he closed down a two-second gap to Rinaldi and blasted past him on lap 13, immediately opening a gap. From there on in, he maintained his impressive pace to the chequered flag to secure a superb sixth-place finish and record his best ever WorldSBK finish at Imola after a very impressive ride. The result means that van der Mark is now fifth in the overall standings with 113 points, just 8 behind Tom Sykes in fourth, and also saw him maintain his run of being ever present in the top six in the last six races. Thanks to his performance he will line up on the front row for Sunday’s Race 2 in third, confident he will be able to fight for a top-five finish. After a day of ups and downs that matched the rollercoaster nature of the Imola track, the Pata Yamaha Official WorldSBK Team are looking forward to returning to action on Sunday at 9:35 am local time (CEST) for Warm Up, with the 19-lap Race 2 scheduled to start at 1 pm. Check out the full Race 1 results.